Our much-anticipated PRO-Plan is live! As you know, SnatchBot’s platform is free to use and it always will be. Our powerful features, including a state-of-the-art NLP system, are at your disposal for free. 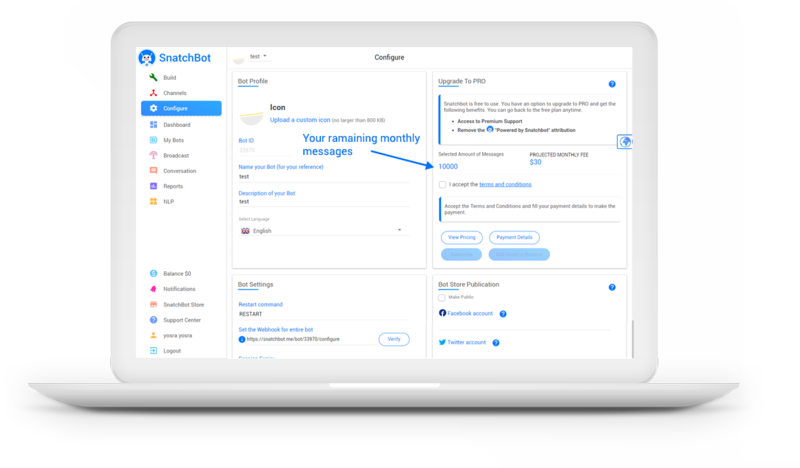 But many users of chatbots created on our platform wanted the option of removing the, ‘Powered by SnatchBot’ branding that you see in the Persistent Menu. So that’s the first reason for putting a chatbot on the PRO-Plan. When you do so, automatically, our branding message is removed. The second reason is for premium support. SnatchBot has a lively community of users, with questions posed and solutions given here. But for those who believe they will need one-to-one conversations and guidance from our team, then taking out the PRO-Plan for your bot is the way to obtain it. A ‘Support Centre’ tab appears in your menu for the bot that allows you to create a ticket for contacting our support team and they will reply promptly. We’ve given careful thought to the best way to price the PRO-Plan, so that it gives excellent value and also so that you are only paying if your bot is really delivering for you. 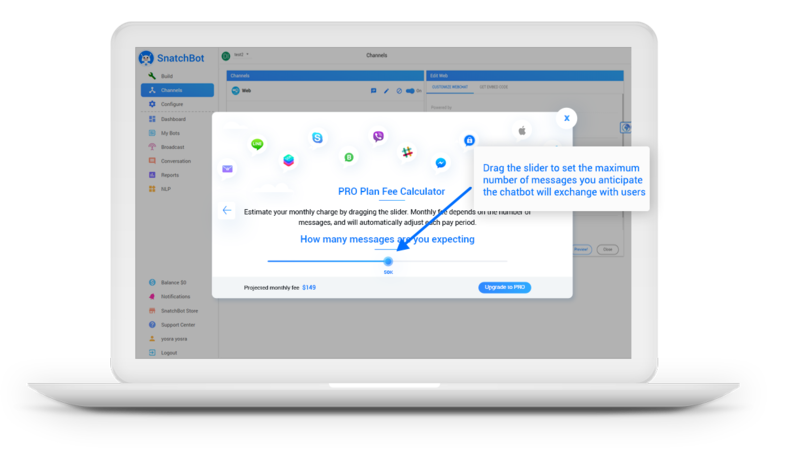 Our solution is a sliding scale, where your monthly payment depends on how many messages per month your bot is exchanging with users. You can try out the scale on any bot by going to the configure page and clicking the VIEW PRICING link. This will bring up a pricing menu. You’ll see that the plan starts with a tariff of $30 a month, for which your bot can exchange 10,000 messages monthly. Then the tariff rises to $79 for the next threshold of 25,000 and so on. If you think the PRO-Plan is for you, then choose your starting threshold and the tariff will apply each month from the day you sign up. Don’t worry if you need to adjust the slider again in the light of experience. You are not committed to your initial choice, you can adjust your plan at any time. Your configure page will show a running total of the number of your remaining messages. And we’ll send you an alert if you are approaching your threshold. Please note that the PRO-Plan applies to individual chatbots, rather than your account as a whole. It’s only the bots that are doing real work that you’ll want to pay for. 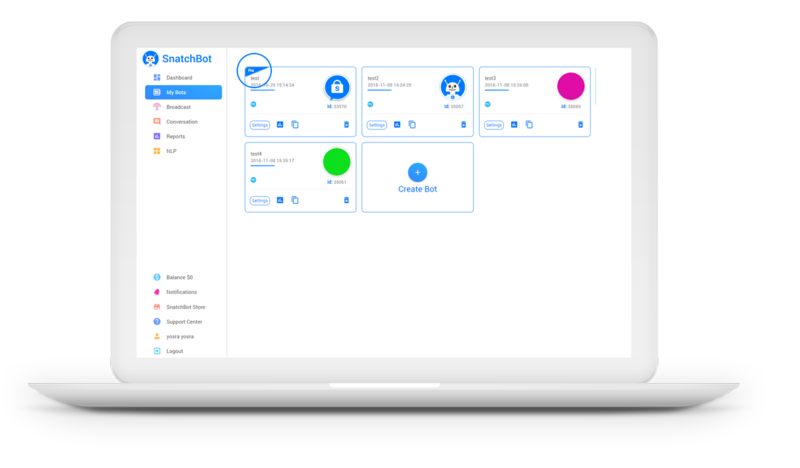 Once you’ve set up the PRO-Plan for a chatbot, you’ll see it gains a blue flag in the top left corner. You’ll also notice that the ‘Powered By SnatchBot’ branding has disappeared from the Persistent Menu. Our intention is to add more features to the PRO-Plan and we look forward to announcing the first of these in the near future. To get started on your PRO-Plan, login, choose your bot and click configure. Q: Why should I upgrade from the free version of SnatchBot? A: All the features of our platform that allow you to make sophisticated, smart, chatbots are free. And they always will be. You should upgrade to the PRO-Plan if it is important to you to have premium customer service or the removal of the SnatchBot branding in the Persistent Menu. Q: What is the cost of the PRO-Plan? A: The cost is proportional to the number of monthly messages exchanged by the bot. The plan starts at $30 a month for a bot that exchanges up to 10,000 monthly messages. Q: What does “messages exchanged” mean? A: When the user types the message or the bot sends one, this is an exchange that will reduce your total by one. Whether you’ve added cards, galleries, RSS feeds, etc. into the interaction that is still only considered to be one message exchanged. Note however that if the chabot’s message is broken into a new bubble or has a delayed response, the new text counts as a new message. Q: What if I anticipate that the chatbot will exchange more than a million message a month? A: Email us at team@snatchbot.me and we’ll find a solution. Q: When will a payment be charged to my credit card or PayPal account? A: As soon as your PRO-Plan subscription is activated we will charge your credit card according to the pricing plan you have selected. Your card will next be charged on the same date of the following month and each month thereafter. Q: Can I get an invoice? Where will it be sent to? A: As soon as your payment has been processed successfully, we email an invoice to the email address you have specified in your Account Profile. We’ll do the same each month. Q: What if I have a change of heart a few days after subscribing to the PRO-Plan, can I change my payment? A: Providing you cancel within 24 hours of subscribing, you won’t be charged at all. This 24-hour, free cancellation rule only applies once a month for each page subscribed to the PRO Plan. After 24 hours, you will be charged according to the pricing of the plan you selected and won’t be able to obtain a refund. Q: How will I be charged if I adjust the message count for my bot during the month? A: If you decide to upgrade during the period before the next payment date, you will pay only the difference between your existing tariff and the new one. You can lower the pricing plan, but if it is more than 24 hours after the payment date, this won’t alter the fact you’ve already paid for the month. Q: Will my payment history be available? A: Once you’ve provided a payment method, you’ll see an “Account Profile” tab which allows you to view your payment details and your payment history. A: No one, not even you will be able to see the full credit card details as we do not store this information. Credit card details are kept securely with Avangate: one of the world’s largest and most secure online payment providers. A: No. You only pay for the messages your bot is exchanging in any particular month and you can cancel anytime.